the Schedule Tribes (Recognition of Forest Rights) Bill 2005, re-asserting the rights of tribal people over land and forest produce, has been stalled. In a last minute change, the bill was dropped from the agenda of the cabinet committee meeting, held on May 4, 2005. Consequently, it was not tabled in the parliament's budget session. Its supporters believe a small but influential group of members of parliament (mps) and politicians, who call themselves "Tiger and Wilderness Watch (tww)", pressured the government to delay it. 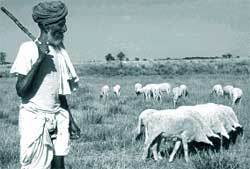 The bill, promised in the Congress manifesto and the ruling United Progressive Alliance's National Common Minimum Programme, was drafted because it was widely accepted that the land of millions of tribals and forest dwellers remained disputed or unacknowledged over decades due to lack of records of rights (see box: Long overdue). The bill came when the Union ministry of environment and forests (moef) had launched eviction drives in forests in many states, calling tribals encroachers. A 14-member technical support group, including officials from seven ministries and seven non-governmental organisations, helped draft it. Warring camps Rumour has it that opposition to the bill gathered thrust due to the presence of Rahul Gandhi, son of Congress president Sonia Gandhi, in tww. tww was formed in the name of tiger conservation but was soon reported commenting on the bill. Rahul Gandhi, rumours say, was convinced that the bill will give away tiger habitat to tribals. But fearing the political implications of opposing tribal rights, the group never publicly mouthed opposition to the bill. The wildlife lobby opposes the bill's provision to hand over 2.5 hectares land to each tribal family. Taking into account India's tribal population of 80 million, it calculates that this will lead to the transfer of 50 million hectares (ha) of the country's 67 million ha forestland to tribals and forest dwellers. But the bill's proponents disagree, explaining that firstly, the bill won't distribute land, but only settle claims of people already living on these lands. Secondly, only claims of people living on the lands prior to 1980 will be accepted. Thirdly, the bill doesn't cover the entire schedule tribe population, restricting rights settlement to only forest-dwelling tribes. For the bill's implementation, the cabinet secretariat wanted the subject of 'forest' bifurcated between moef and the Union ministry of tribal affairs (mota). It ordered that all issues regarding tribal rights in 'forests' be dealt by mota. moef was reportedly infuriated and decided to fight the bill. tww and the wildlife lobby gave it cover. Now, parliament's monsoon session will decide the bill's fate.